A number of delays and cancellations have been issued at Toronto’s Pearson International Airport after a fire sent smoke billowing through terminal one on Sunday night. Peel Regional Police said the fire started in the ceiling on the lower level of the terminal sometime before 6:30 p.m. and was quickly extinguished. The fire caused smoke to rise up to the second level, prompting airport police to close the terminal. Toronto Pearson said passengers were safely evacuated from the affected area. All U.S.-bound flights scheduled to depart from terminal one have been cancelled, while several international flights have been delayed until Monday. As of 9 p.m., some flights were holding at their gates. International and transborder screening processes were stopped while officials worked to get the situation under control. The screening points reopened at around 10 p.m. but police said it will take time before the backlog of passengers is cleared. The situation is also impacting baggage claim. Police could not provide an estimate on when normal operations would resume. Passengers heading to the airport are being advised to check their flight status with the airline. “All international and U.S. bound aircraft are holding at their gates,” the Greater Toronto Airports Authority told CP24 in a statement. Videos from travellers show heavy smoke spreading through the terminal. In one video, passengers can be seen covering their mouths with their hand to prevent breathing in the smoke. Emergency services remain on scene investigating. The cause of the fire is not yet known. There have been no reports of any serious injuries, but police said paramedics treated “a few patients” for smoke-related injuries. At least one person was taken to hospital for further treatment. “At this time there’s no indication that it was suspicious, but we will work with our partners to figure out what exactly happened,” Const. Akhil Mooken said. Police said crews are working to clean up damage caused by smoke and a “significant amount of water” used to extinguish the blaze. Mooken said the second floor of terminal one was “cleared” after officials found no concerns about air quality. A passenger travelling to Fort Lauderdale, Florida with her family told CP24 that they saw smoke in the terminal long before an alarm went off or an announcement was made. “We smelled smoke around 6:10 p.m. We went over to the gate and asked them. We said we saw smoke. They said, ‘There’s nothing to worry about.’ About ten minutes later another passenger came back and said, ‘The whole terminal is filled with smoke,’” the woman, who did not provide her name, said. The woman said an alarm eventually went off and airline workers started to herd passengers to another terminal. A woman who works at the airport told CP24 that communication between airport officials and passengers was insufficient. She said the lack of instruction quickly turned the terminal to chaos. “At first nobody knew there was a fire because there wasn’t an alarm or anything like that. The smoke and the smell was overwhelming, that’s how I knew I had to leave…People were clueless. They didn’t know how to get out,” she said. 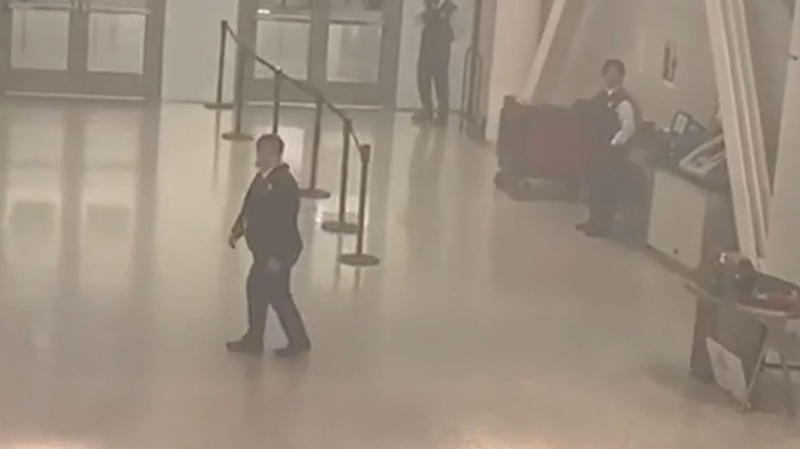 Smoke is visible inside Pearson Airport after a fire broke out in terminal one on March 17, 2019. 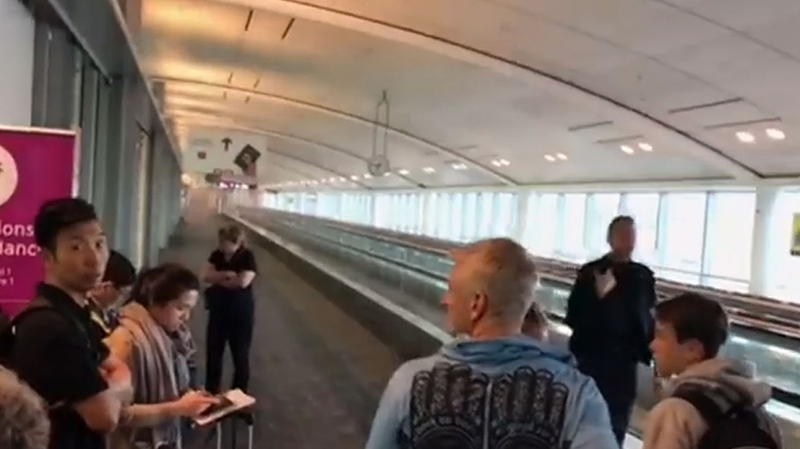 Passengers at Pearson Airport are held back by officials after a fire broke out near terminal one on March 17, 2019.